Lately I’ve been trading Internet business consulting for exquisite chocolates made by my friend Mark Sciscenti, the man behind World Tree Chocolates. The site doesn’t have a shopping area yet, so you’ll have to be patient before you can purchase your own soul transporting confections from Mark. However, the website we put together does include a blog, essays on chocolate history, and best of all: chocolate recipes. You can also subscribe to his blog via email so that each of Mark’s missives are delivered directly to your IN box. "The Ancestral Puebloan peoples (commonly known as the Anasazi) had drinking chocolate brought up from Mesoamerica for use at Chaco Canyon. 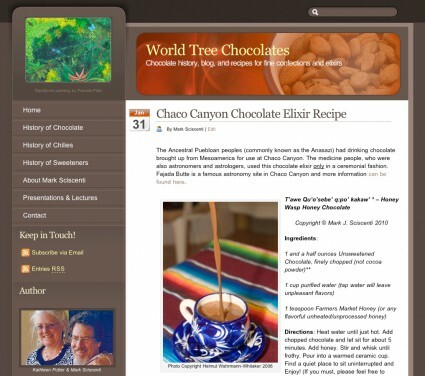 The medicine people, who were also astronomers and astrologers, used this chocolate elixir only in a ceremonial fashion..."
Click here to continue reading Mark’s post on how to replicate Mesoamerican or Ancestral Puebloan styles of drinking chocolate.